John McCabe's 70th birthday year 2009 has seen a number of recordings or performances reissued on CD, or released for the first time. Several appear in series labelled Historic. 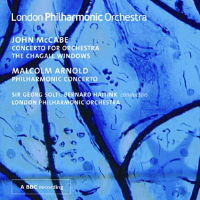 The London Philharmonic Orchestra's own label has released a CD in their Historic Reissues series of performances of Concerto for Orchestra and The Chagall Windows, plus Malcolm Arnold's Philharmonic Concerto. The McCabe Concerto, conducted by Sir Georg Solti, is, like the Arnold, the world première performance. "[Concerto] Solti's world première performance...remains a scintillating interpretation which deservedly drew sustained critical plaudits at the time...[it] sounds as fresh as when it was unveiled...[Chagall Windows] the orchestra audibly relish its brilliant textures; no wonder they took it on board as a repertory piece. This is an essential disc for lovers of British music and is very strongly recommended"
"...these are three superbly effective display pieces for large orchestra, and they receive stunningly flamboyant accounts with the LPO, Bernard Haitink and Georg Solti all on top form...The brilliance of both composers' instrumental scoring is matched by the sheer brilliance of the LPO's playing, and collectors of Haitink and Solti should certainly hear them"
"This beautifully produced release is a timely tribute to John McCabe on his 70th birthday and a well-deserved homage to his unflagging dedication to British music." 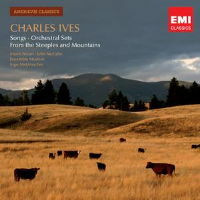 In 1967 John McCabe recorded a selection of 13 Songs by Charles Ives, with the famous American soprano Marni Nixon, for a Pye LP. This was his first commercial recording, and in 2008 EMI, who now own the Pye catalogue, decided to reissue this recording in their series. It is programmed with a collection of Orchestral Sets and other works for orchestra, performed by Ensemble Modern, conducted by Ingo Metzmacher. It is particularly appropriate for this to be reissued in view of McCabe's long involvement with, and championship of, American music. The 13 Ives songs are: The Greatest Man, At the River, Ann Street, Christmas Carol, From 'The Swimmers', West London, Soliloquy, Charlie Rutlage, Side Show, The Cage, Farewell to Land, and General William Booth Enters into Heaven. 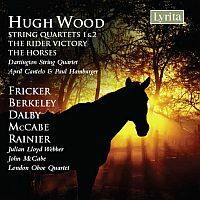 This 2-CD set also includes four works by Hugh Wood, from Argo LP recordings of 1974, the String Quartets Nos 1 and 2, and two song-cycles: The Horses and The Rider Victory. The disc is completed with two works by Priaulx Rainier, also from British Council recordings of the 1970s: Quanta, her oboe quartet work, and the String Trio. "[represented] by the Black Dyke Mills Band's dazzling "The Complete Champions" (with John McCabe's wondrous Cloudcatcher Fells the plum)." This set of 30 CDs is available for the price of 3! 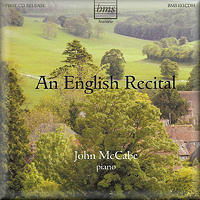 Since their première at the 1964 Cheltenham Festival, John McCabe's Three Pieces for Clarinet and Piano have firmly established themselves in the clarinet repertoire – the second, Improvisation (Bossa Nova), in particular has become a favourite encore and examination piece. 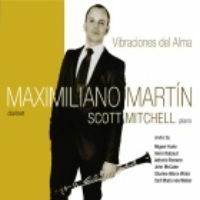 A new recording has been released on Linn Records, performed by clarinettist Maximiliano Martín, with Scott Mitchell (piano). The CD is entitled Vibraciones del Alma (Vibrations of the Soul), the title of the first piece on the disc, by Miguel Yuste, and the programme also includes Weber's Grand Duo Concertant, Op 48, and music by Rabaud, Antonio Romero and Widor.